Its officially race week! Its a bit surreal to think that at the end of this week that I’ll be running my big fall race! Since the end of April I’ve been in training for a major race (first Rock ‘n’ Roll Virginia Beach, now Army Ten Miler), and that after Sunday’s race I won’t be “in training” anymore. While I’m mentally and physically ready for a break, I’m also working on figuring what my next major race will be because I know that I won’t be able to sit still for long. I spent quite a bit of time over the weekend working on my end of 2014 race calendar, and plotting out all of the possible races I want to consider running in 2015. With Army Ten Miler being my 13th race of the year, I will only be one race away from completing my 14 in 2014 goal. I had initially planned on my 14th race being the Veteran’s Day 5k that I ran last year, but since we’ll now likely be out of town that weekend I’ve turned to figuring out alternate plans. I’ll share those plans, as well as my plans for 2015, once they’re a bit more concrete. As far as my training this past week, it felt so good to make my last full week of training a strong week. I completed my long run Saturday afternoon, and while I felt great for the first couple of miles, the majority of the run was very much a physical and mental struggle. I’m beyond thankful that Preston completed the run with me, as I’m not sure that I would have been able to successfully complete my planned eight miles if he hadn’t been there encouraging and supporting me. I’m beyond thankful that Preston ran with me on Saturday! This coming week will be my mini taper, and then Sunday morning I’ll be running my big fall race! While this course will be challenging (its a bit on the hilly side), I can’t wait to push myself and see what I’m capable of! QOTD: What are you currently training for? 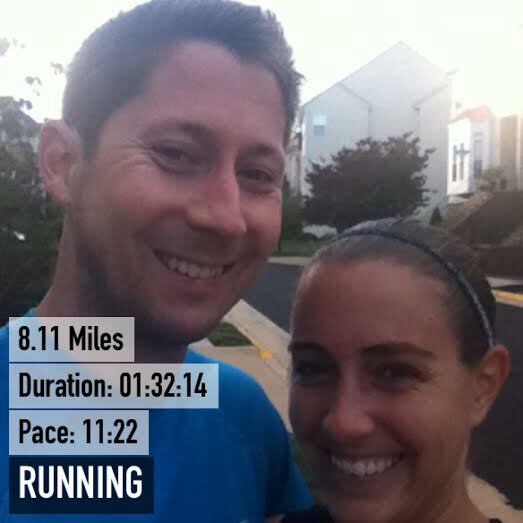 This entry was posted in Army Ten Miler Training, Training and tagged Army Ten Miler, Cub Run Stream Valley Trail, elliptical, running, ten miler, ten miler training, ten miler training plan, training, training plan, walking, weekly recap, weight training, yoga. Bookmark the permalink. Yes, me too! Its one of the reasons why I make sure to recap each of my training weeks. Good luck this week – you got this Kathryn!! have fun at the army 10 miler – i’m sure you love it and have a great race! i’m training for richmond – woot woot! Thanks Mindy! I can’t wait to finalize what my next goal race will be, and of course, share it with all of you! Good luck! Thanks for sharing your training-I enjoy seeing the progress of another dancer turned runner 🙂 As for me, I have the Rock ‘n’ Roll Denver half marathon in 2 weeks and then I’ll be training for speed in shorter distances. I’m in red as well. Hopefully I’ll see you on Sunday! Goodluck in your big race! Yuck! The hills don’t sound too fun. I hope MCM doesn’t have many.. .haha. Enjoy your taper week. Relax! Yes, hopefully I’ll see you on Sunday!